Hello, my name is Valerie and I have a problem: I have chronic pain and fatigue. I also am a very stubborn person who insists on doing what I want, when I want, as much as I can. These two parts of who I am clash very often and result in me feeling like I am about to die, usually in very interesting places. Today I will tell you the story of how I felt like death was coming for me at a sheep farm in Cheltenham, and how my insane love of music got me there. If you read my blog last year, you’ll know that I fell in love with the music festival 2000 Trees. Almost immediately after getting back to the USA, my friend Hindi and I booked tickets to attend again in 2015. However, due to my chronic health issues I can’t just YOLO* as I please (*Val’s note: Yes, I use YOLO as a verb; it means being spontaneous because, of course, “you only live once”). A great deal of thought has to go into much of what I do to make sure I can kind-of-sort-of survive the event. Our 2000 Trees jaunt was no different. We decided to go for glamping this year so we didn’t have to pack our own tents, and we’d have air mattresses rather than just sleeping on the floor. We planned, with the help of our friends, to have cider on hand, both for fun and numbing any potential pain flare ups, and one even got me a little camping chair so I’d be able to sit and watch the bands. When the line-up for 2015 was announced, I was beyond thrilled to see many names I already enjoy on the bill. That coupled with the atmosphere I knew 2000 Trees had reassured me I had made the right choice in attending again. Everyone is so friendly, it feels like a giant party with friends (who are actually strangers). You have these fleeting encounters that are so special and stand out as top memories, both with fellow punters and the artists themselves. I heard there were ~7,000 people in attendance this year, more than last year, but still small in comparison to other fests. This, paired with the magic of busking stages, create an intimate and beautiful haven for music lovers. We arrived on Thursday very late due to train issues, so we missed most of the bands on the actual stages. We did however make it in time to head to Camp Turner for a special busking set from Jim Lockey who was performing a mix of old and new songs from Atlases, Death, and the recent Solemn Sun EP. It was like last year's magical set of his — so many people with an intense love of his songs, singing loudly but still soft enough to hear Jim’s voice over the rest of us, filling in the blanks when he occasionally forgot the lyrics to the really old ones. As I sat in the circle, having only arrived on the site about 45 minutes earlier, I slowly spotted friends and acquaintances in the crowd. We’d wave hi to one another, and afterwards exchange hugs and catch up on life, since it had been a year since we saw each other last. We shared drinks, and looked up at the sky and tried to spot constellations as Joe McCorriston played just a few feet away from us to the rest of the camp. We don’t have clear skies like that back in New York. The next day, Hindi and I were greeted at our tent by our friends who had come to collect us for breakfast and to plan our attack for the day. We loaded up on all the iced coffee we could find, and hiked across the farm to The Croft stage, which is where I personally ended up seeing all the bands who weren’t on busking stages. 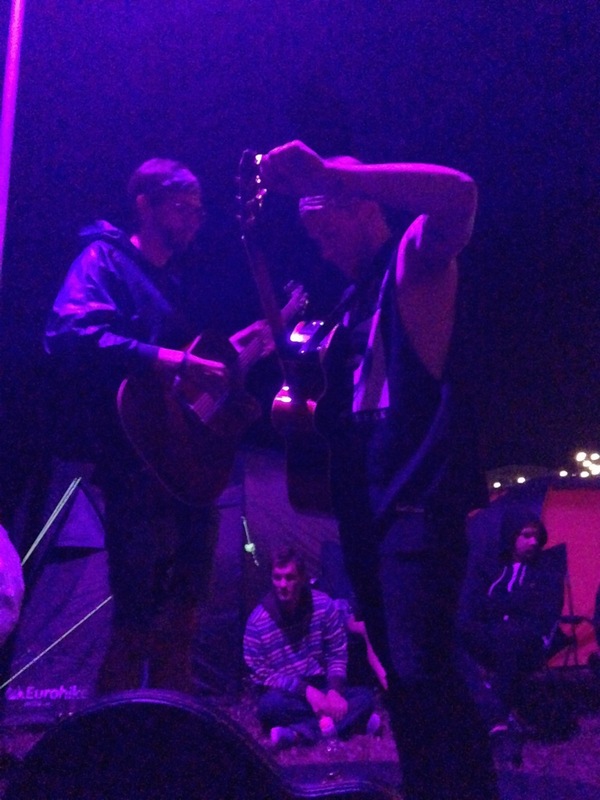 Here we watched Sam Russo, The Lion and The Wolf, and Rob Lynch perform. PJ Bond joined our little circle of friends at the back to watch the last two, since us Americans have to stick together when abroad, and Barry Dolan (Oxygen Thief) joined us as well here and there. We shared snacks, and more drinks, and let the great acoustic tunes wash over us in the warm air. I had seen Sam Russo open for Frank Turner in 2013 at the Hatfield Forum and I enjoyed him very much, so seeing him again was a no-brainer. Tom George, aka The Lion and The Wolf, I had met earlier that week at XMR’s Summer In The City party and was keen to see him in action. His set was particularly funny as Barry Dolan had a song request, but didn’t want to shout it at him. Instead, being the polite British man he is, Barry wrote a note and had the crowd pass it up to the stage. A true gentleman and professional, Tom read the note and performed the request much to Barry’s delight, and everyone else’s confusion at a note being passed from crowd to stage at a gig. And I became a fan of Rob Lynch last year sometime but unfortunately missed him in NY on Warped Tour because I was at Trees that same weekend. Hindi and I passionately shouted along to him. I had a lull in bands I was wanting to see, so I headed back to our tent to stretch and rest a bit. The glamping area was atop a large hill which made getting to it a struggle for me, with such angry legs, but once you’re up there you can hear the Main Stage, Axiom, and The Cave perfectly. They fight for your ears; when one stage fell quiet, another jumped in to fill the dead air. I heard some of Young Guns and eventually Idlewild from here, as Hindi and many of my other friends were down in the crowd. I also accidentally fell asleep and had myself a little disco nap. You see, the other side of fatigue is insomnia, so I hadn’t been sleeping well on this trip and it caught up with me which unfortunately meant I missed Solemn Sun’s set. Fortunately, a sheep was very close to my tent and made some weird noise that woke me up, meaning I could hear the very end of their set now that I was conscious again. I eventually made my way back down to the main area and found my friends, got some food in me, and more cider and boxed wine. 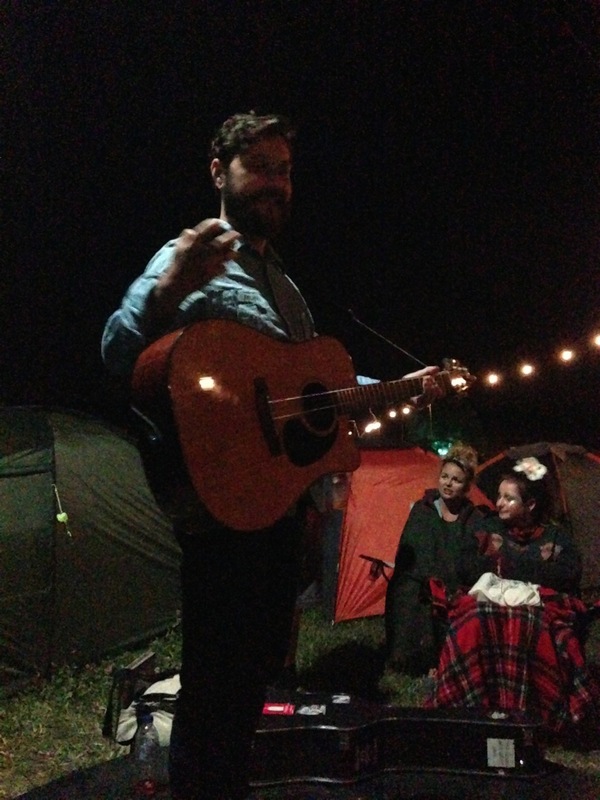 We then went over to Camp Turner again for a bit of a hang out and to get a good spot for PJ Bond’s acoustic set. Five minutes before he was due to start, it began to drizzle and he raised his arms to the sky and asked “really! ?” — a question I wanted to ask as well. The rain soon stopped, which leads me to believe PJ may have weather-controlling powers. When he started his set, there were a decent amount of people sitting around, and in time the crowd grew and grew, and I watched with glee as they became more entranced by PJ’s incredible songs. Before he played his last song, he thanked the crowd and told everyone: “Look out for each other. Don’t do anything too stupid. Don’t die. Stay alive. It’s way better above ground.” I smiled to myself, made note of his words, and thought of how that isn’t just good festival advice, but good life advice as well. I also got to see Tim OT play, an artist whose name I had seen around for ages but somehow I never actually listened to him. That’s part of the beauty of Trees: you can’t sit there on your phone when an artist you don’t know is on. You are sitting in the dark with your friends watching these folks perform and it commands your full attention, fully appreciating music for what it is, no fancy theatrics, no smoke and mirrors, just people with their instruments and voices. Tim’s last song, 'Unheard Voices', was one about his musical idols that he said he wrote when he was 19 and it has been stuck in my head on and off since seeing him. I look forward to further investigating his back catalogue once I have access to more reliable wifi. Next was Rob Lynch again, who had mentioned to me at XMR’s party on Wednesday he didn’t know what he was getting himself into by playing camps, and thought he’d be playing to a few kids round a fire. That wasn’t the case; Rob was playing to at least 50 people at Camp Turner. Everyone was dancing and singing along, growing louder and louder with encouragement from Mr Lynch; who, during 'Hawking', started shouting: “LOUDER! COME ON! LOUDER! WAKE THEM UP!” The set ended with 'My Friends and I' (of course) but Rob was joined by PJ Bond and The Lion and The Wolf (who ended up crowd-surfing! ), making it all the more special and emotionally compromising. After a strong finish from Camp T, we wandered over to the newest camp — Camp Marwood. Here, we found Barry about to do his thing as Oxygen Thief, and he opened his set with a Ben Marwood cover ('Horatio Dies'). He played my favorite song of his 'All Done Bye Bye' which is off his first album, and I think he only plays it when I’m around. Beforehand, he mentioned to the crowd Hindi and I had come over from America for the festival and we started a USA chant. 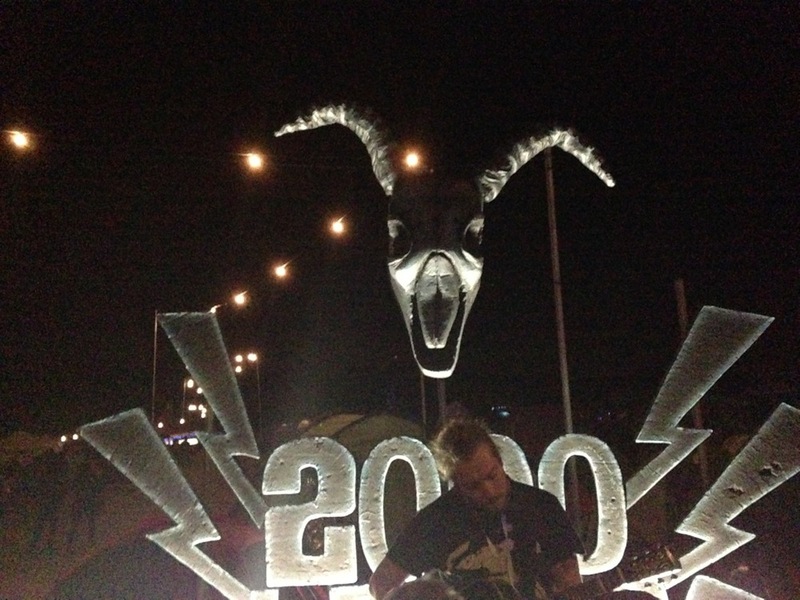 Yet the true highlight of Barry’s set was during 'Disaster Plan'. If you know the song, you know towards the end it mellows out before it breaks into a bit that goes: “Hey kids this is where mom met dad…” At the camp, it mellowed out and people started to cheer, which my friend Hannah was NOT having. She started yelling — “STOP CLAPPING, HE STILL HAS TO SPEAK TO HIS KIDS!” — and I swear, in that moment, it was the funniest thing I’ve ever seen. We dropped to our knees and started bowing to her for defending Barry and his song, and he finished the last bit, and we all cheered and then headed off into the night for Silent Disco. I woke up Saturday feeling awful, but still soldiered on over to The Croft. There was no one in particular I wanted to see except Jurassic Pop, which would feature Barry Dolan sampling audio from the Jurassic Park films. While waiting for them, I saw many good bands, but I can’t really remember them aside from the fact I did like them. This was because my pain was really acting up and I was putting a lot of energy and focus into seeming okay. It’s kind of like “if I can trick my friends into thinking I’m fine, maybe I’ll trick myself into being fine”. So far, that has never worked but, you know, we still try. Jurassic Pop was a lot of fun, and I snagged a t-shirt. It was about 3:30pm when we headed back for pizza and the reality of the situation was hitting me fully...I couldn’t last another night on Upcote Farm, I was that bad. My legs were bouncing between shooting pains and numbness, my back was in spasm, and I was feeling dizzy. At first I tried to lie to myself that I could stay longer to at least see Skinny Lister — who were on around 5pm — but nope. I needed out, and I was furious about it. Being chronically unwell means you learn to expect things like this to happen from time to time. It just becomes part of your “normal”. However, no matter how many times you get a flare up, where it feels like your spine is collapsing upon itself and your legs will give out on you, it never becomes less annoying. It is frustrating to not be able to do what everyone else can do; it ruins your plans; it steals control away from you. You become helpless to what your body is doing, which is basically having a temper tantrum. I was on 2000 Trees’ social media team this year as well, so leaving early meant I couldn’t fulfill my duties for them, making me even angrier. I hobbled over to apologize and explain I needed to leave and started crying because I was at the end of my rope. The beyond lovely staff calmed me down, gave me some biscuits, and called for a jeep to come collect me, my belongings, and drive me up the hill to where a taxi could eventually get me. I sat up there, stewing in my own misery and agony, while listening to Skinny Lister perform their hearts out on the Main Stage somewhere behind all the trees. I sulked the whole drive to the hotel, and had a little cry upon flopping down on the bed in defeat. Over the course of the night I began to feel a bit better. I could stretch and eventually move more. By the next morning, I was miles away from how broken I was the day before, though still not operating at full capacity but any improvements are celebrated. I was still sad to have had to leave early from the festival I had spent all year dreaming of, but I knew I did the right thing. Music is powerful. It pulls me across borders and oceans to experience it live even though I know there is a good chance I could actually end up in a hospital, or self-imposed bed rest (to avoid the hospital). Let me be clear — I’m not being unsafe with my wellbeing. I take as many precautions as I can. I always travel with my medications, heating / ice patches for my muscles, and I take a walking stick with me almost everywhere I go — the one I have folds up very small so it fits in my purse. Even when you do everything right to take care of yourself, things can happen and throw you for a loop. You just have to take a deep breath, try not to be in denial about it for too long, and do what you can — and also trust that looking back you’ll feel the adventure was worth the suffering. For me, I knew going into 2000 Trees this year that it was very likely I’d fall apart again; but I also knew that there is nothing else like this festival and any time I could have there would be worth any agony I’d eventually face. I don’t wish this pain-filled life on anyone, but I do hope you find something that means as much to you as this does to me. But if you made it to the end of this post, I reckon music is your thing too. High five. Just quick: as Val says, don't take unnecessary risks with your health, ever. Go see a doctor, make sure you know everything you can about any condition you might have, and (just as important) don't let it get you down. Life is hard by degrees, and Val is pretty awesome at putting up with huge amounts of crap her body throws at her. But she's not superhuman (well, not that we've asked) and neither are you. Be careful, but have fun. Also, if you feel like supporting a good cause to help others, why not donate to Val's JDRF One Walk team, 'The Bionic Pancreas'? Not only is she risking pain and suffering for the walk, but she's doing it to help diabetes sufferers, which include her lovely brother. Go here if you want to sponsor any amount. Basically, go and do something worthwhile, all of you. Now. 2000 Trees this year was my first and to say I had the time of my life is an understatement. Upcote Farm is magical, and no one is going to be able to convince me otherwise. I spent the weekend with Lottie, my best friend, in Camp Turner — a camp made up of some of the best people I know. People I've seen on the road, people I've only ever known online, and people I've never met. The camp became one of my favourite places on the site, alongside the calm tranquility of the forest. Despite it being my first year, everyone made me feel so welcome and included in camp. I was quickly making new friends; friends I definitely plan on staying in touch with. Lottie and I are both on the XMR Street Team, so we (well, Lottie) grabbed some merch from the lovely Val, and we planned our attack. Our most successful mission was right before Rob Lynch's set at The Croft. We handed out lots of stickers and leaflets to the waiting crowd. Rob was someone neither of us had gotten round to listening to before Trees, and we went to his set simply because we had a gap and he was on Xtra Mile - a good time to do our street team thing. I'm incredibly glad we did, because he blew us both away. I was lucky enough to catch both his busking sets as well that evening, and each time he was spectacular. A highlight of the weekend. Another highlight of my weekend (not including the busking sets because they were the best, Jim Lockey being my favourite of the whole weekend) was Skinny Lister. They were another band that I hadn't listened to before, but wanted to see because they were on Xtra Mile and plenty of people had said how good they were. They were good indeed and dancing with new friends and old was so much fun. Skinny Lister are an incredible live band, and I can't wait for the opportunity to see them live again. I have to admit to being a little unsure of how I would like Trees. Could the praise it was getting from everyone really be true? I quickly found out that of course it was true! It's one of my favourite places and I can't wait to go back. It is exactly things like 2000 Trees that remind me exactly why I love music. "My friends and I, we got a lot for. My friends and I, we live the good life at least just for tonight"
We encourage everyone to take care of themselves at festivals and gigs and, well, everywhere. We also encourage you to tell us about your musical happenings. What gigs have you seen lately? Tell us about them yeah? We will, on occasion, publish stuff we really like so send your witterings (writterings?) to contributions[at]xtramilerecordings[dot]com. See you down the front sometime soon!